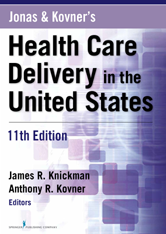 Editor/Author Kovner, Anthony R. and Knickman, James R.
Designed for graduate and advanced undergraduate students of health care management and administration and public health, the text addresses all of the complex core issues surrounding our health care system in a strikingly readable and accessible format. Contributors provide an in-depth and objective appraisal of why and how we organize health care the way we do, the enormous impact of health-related behaviors on the structure, function, and cost of the health care delivery system, and other emerging and recurrent issues in health policy, health care management, and public health. Who's in Charge of Public Health? Who Is Part of the Health Workforce? How Do We Improve Quality? How Do We Incentivize Quality Care? What Are Major Recent Developments Affecting Quality?